Wrathie and I are both thinking about buying PSPs right now. There’s a lot of different models to choose from, such as PSP-1000 (fat), PSP-2000 (slim), PSP-3000 (brite), or a PSP Go (gay). Obviously, we will not be getting a PSP Go…With all of our searching on PSP deals, we decided to post an old rumor about the PSP-4000. We also decided to post a deal on the PSP-3000! Well well, what do we have here? 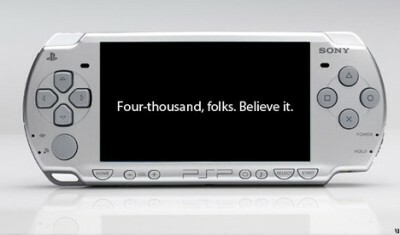 Rumors of an upcoming Sony PSP-4000? Somehow we’re pretty much not surprised by such whispers, and old school PSP lovers will be thrilled to know that the PSP-4000 has no relation with the PSP Go, but will instead replace the current PSP-3000 which would probably mean retaining the UMD drive. Of course, as with any other rehash, we would look forward to a much better looking display and prolonged battery life among others. This rumor could hold a whole lot of water since it was the same person who leaked plans of the PS3 Slim earlier. I promised a deal on the PSP-3000. Well, go to the Dell PSP 3000 Page and use Dell Home Coupon: 6FWJ247J1P44CK (Expires: 10/31/2009) for a price of $144.99 with free shipping. Now, Wrathie has informed me that Japan has dropped their prices on the PSP-3000. This means that prices elsewhere may very well drop soon too. $144.99 IS a good deal, but if the prices drop in all stores, then places like Dell may drop theirs as well resulting in an even lower price after a coupon. A hard decision indeed. This entry was posted	on Friday, September 25th, 2009 at 5:22 PM	and is filed under Deals, Games. You can follow any responses to this entry through the RSS 2.0 feed. You can leave a response, or trackback from your own site.